My Hunni must love me because a few years back, he bought me a very expensive Laundry Aid. Now we are not the type of family that spends money on unnecessary gimmicky products, so if you are wondering if I actually use this expensive Laundry Apparatus, I can assure you that YES! I use this Laundry Apparatus about 360 days out of the year. 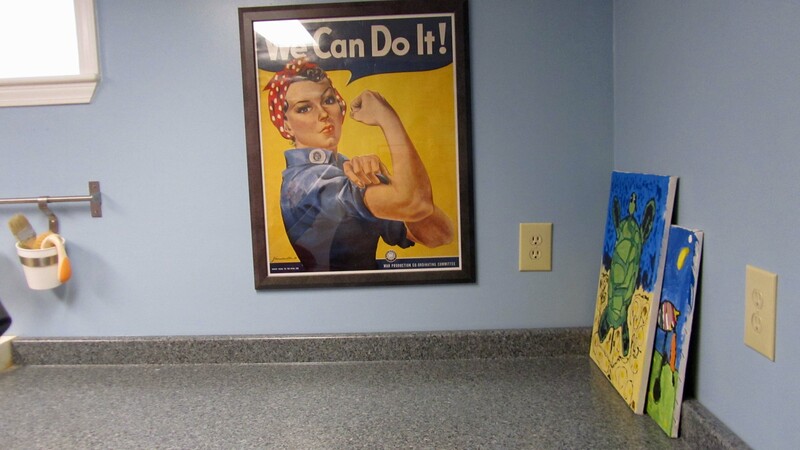 And this is why I have Rosie the Riveter in my Laundry Room to keep me company. 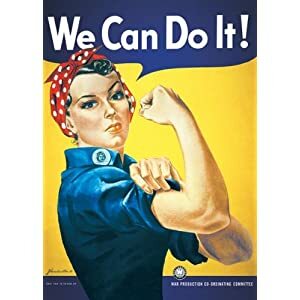 Rosie flexes her muscles and says to me “You can do it! 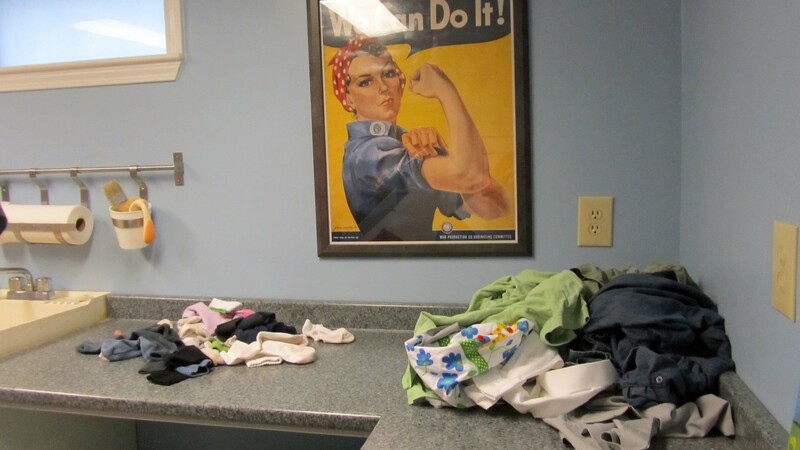 For the good of America and all the free nations, keep on laundering!” Rosie is a great encourager, but she rarely pitches in and helps sort, wash, dry, fold, or hold the clothes waiting to be ironed. Which is why I am so thankful for my expensive Laundry Apparatus as it actually helps in giving physical (not just emotional) support. Here is my week in photos. 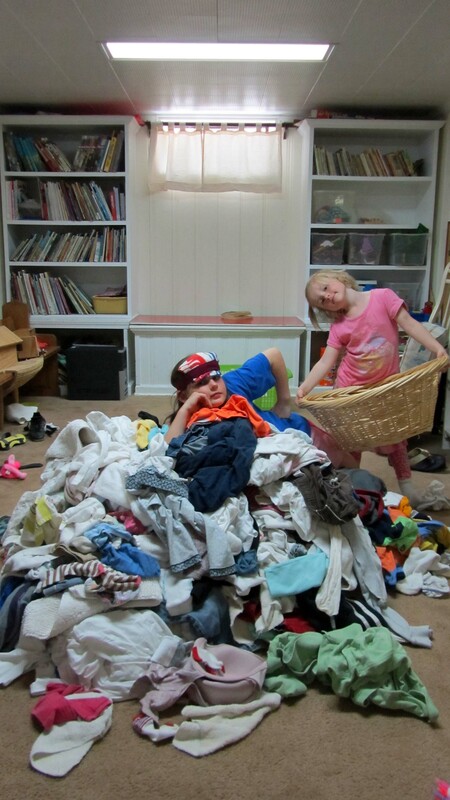 Saturday: We fold a pile of laundry. Sunday: On the Day of Rest, the Laundress also gets to rest. Monday a.m.: The first load comes through. 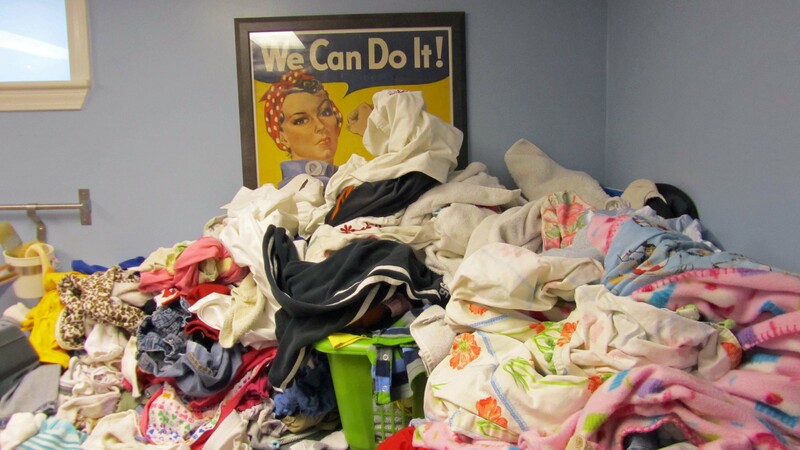 Also there are socks that couldn’t find their mate after Saturday’s folding extravaganza. They are enjoying their temporary “single” status. I hope that they aren’t widowed for life. Tuesday: The loads pile in. 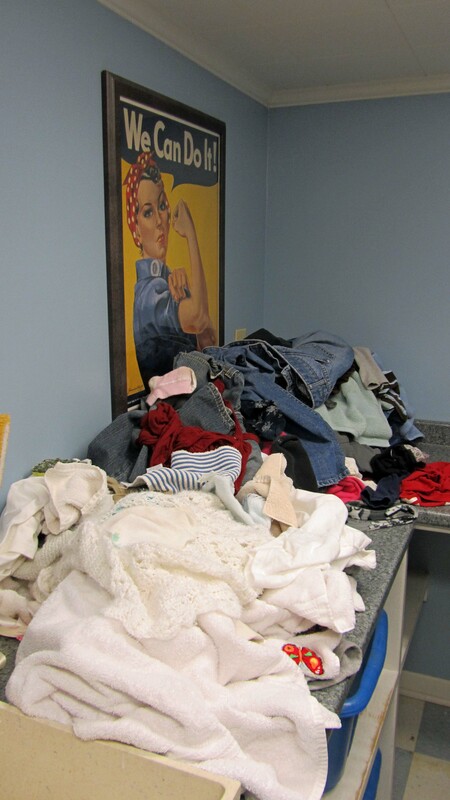 Thursday: “I’m drowning in laundry!” says Rosie. 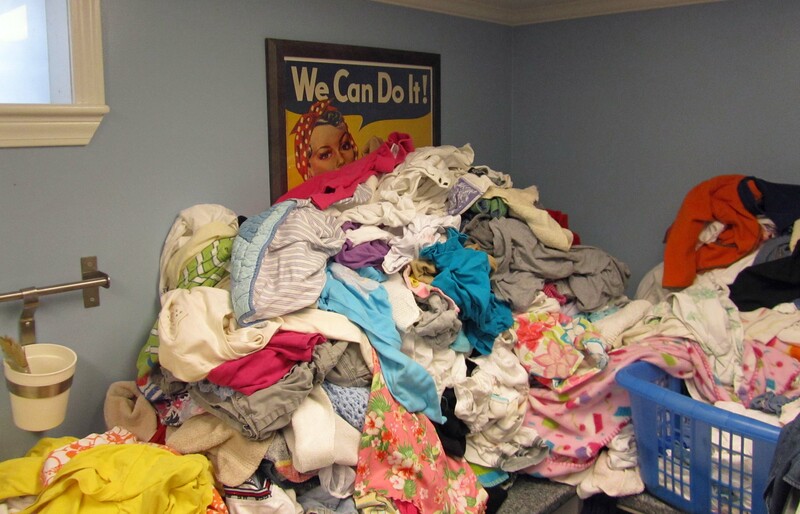 Saturday: Now I would love to tell you that I am going to get this all folded today, but we have a piano recital, a soccer game, and a double-header in baseball. So you can see, that I need all the help I can get, and this is where the Laundry Apparatus plays a role. It is completely digitalized and modern. And here, folks is that handy, very expensive, Laundry Apparatus. 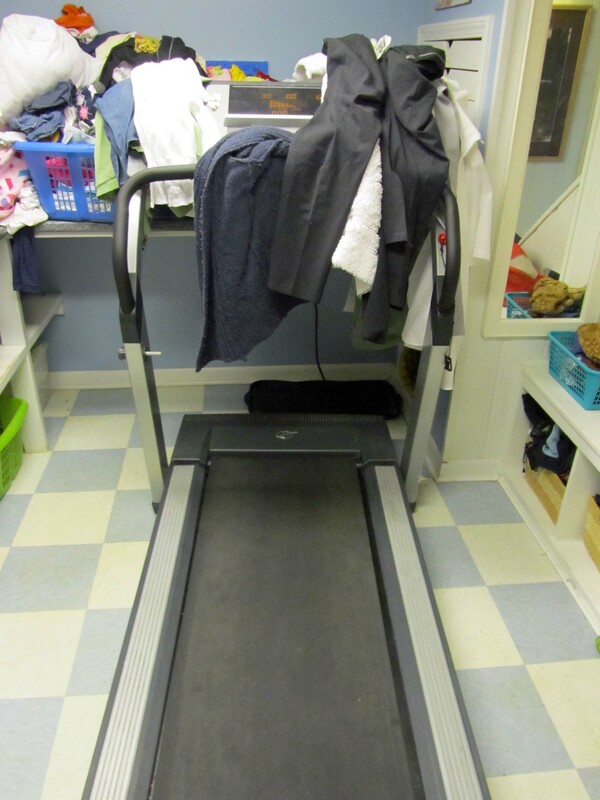 It is the most expensive needs-to-be-ironed-clothes hangar on the market. It is used everyday, and fully digital and modern. It even gives me physical support. Maybe you have one also. P.S. A captain with whom my Hunni flies, said that the Bow-Flex might be a better investment, as it holds more clothes. P.P.S. If you would like Rosie to keep you company in your laundry room, you can order her by clicking on the link below. She’s quite likeable and understands about “bad hair days”–notice that her hair is hidden, and she likes chocolate–she told me so. I had a chat with another “Rosie” today. She was on the move from Bridgeport to “back in the woods”. No. she wasn’t looking for a cheaper apparatus to hang her clothes on, there are plenty of trees where she went. But she ended up in the same situation as your “Rosie”. Besides the laundry, Rosie had boxes and boxes to unpack, but I think she might have taken a break from the day’s activities and taked a long soak in the tub…Craig and Amy made the move today to their new house! Wonderful! Now they can just work on one house instead of both. Looks like a Grandma or TWO could make a trip out there!! Are you game, Barbie? Okay. I didn’t see that coming. I really thought you had some miracle I hadn’t heard about. Pout. I guess I’ll have to do my own laundry after all. 😦 My laundry room won’t even hold your apparatus. Double pout. Thank you for the darling calendar! Good to hear from you! We aren’t too far from Greg and Karin, and occasionally bump into them. I guess laundry is the same in the Southern Hemishere. Sigh, I had planned on buying a ticket there to get away. (See Rebecca’s Terrible, Horrible, No Good, Very Bad, Day.) Thanks for stopping by. 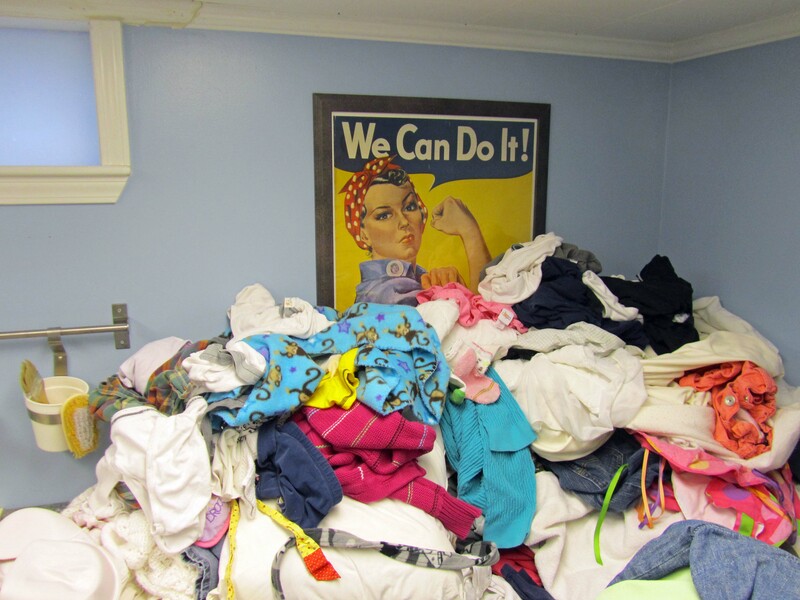 Your laundry room looks like mine! Where no oxen are- the crib is clean! I think we have the same amount of oxen! Hope you are feeling better. I’m sorry that I asked if your stomach was glowing. I really was worried about you, and I hope this latest medication works. Thanks for stopping by.